equiFilt = design(d,'equiripple','SystemObject',true) designs an equiripple FIR digital filter using the specifications supplied in the object d. Equiripple filter designs minimize the maximum ripple in the passbands and stopbands. When you use equiripple with Nyquist filter specification objects, you might encounter design cases where the filter design does not converge. Convergence errors occur mostly at large filter orders, or small transition widths, or large stopband attenuations. These specifications, alone or combined, can cause design failures. For more information, refer to fdesign.nyquist in the online Help system. equiFilt = design(d,'equiripple',designoption,value,...,'SystemObject',true) returns an equiripple FIR filter where you specify design options as input arguments. To determine the available design options, use designopts with the specification object and the design method as input arguments as shown. For complete help about using equiripple, refer to the command line help system. For example, to get specific information about using equiripple with d, the specification object, enter the following at the MATLAB prompt. options for the specification object and method. DESIGN Design a Equiripple FIR filter. when MPHASE is TRUE. MPHASE is FALSE by default. has the shape defined by SHAPE. SHAPE can be 'flat', '1/f', or 'linear'. SHAPE is 'flat' by default. specifies the slope of the stopband in dB/rad/s. 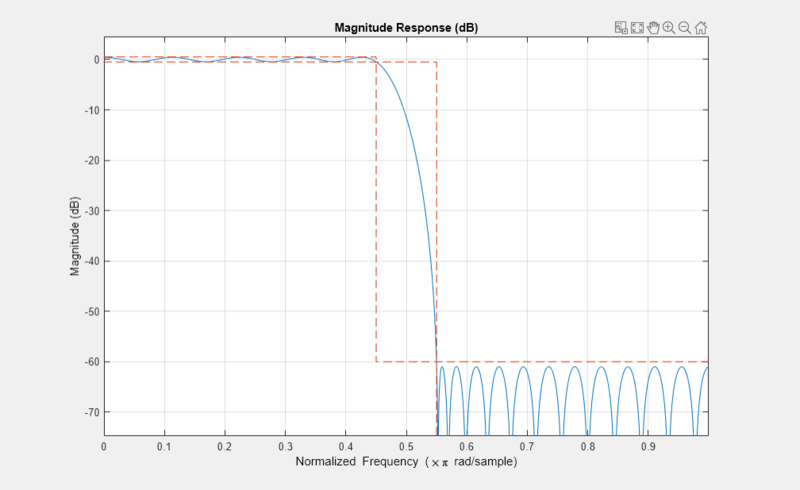 % Example #1 - Design a halfband lowpass equiripple filter with increased stopband attenuation. The fvtool shows the equiripple nature of the filter. This example designs an equiripple filter with a direct-form transposed structure by specifying the 'FilterStructure' argument. To set the design options for the filter, use the designopts method and options object opts. 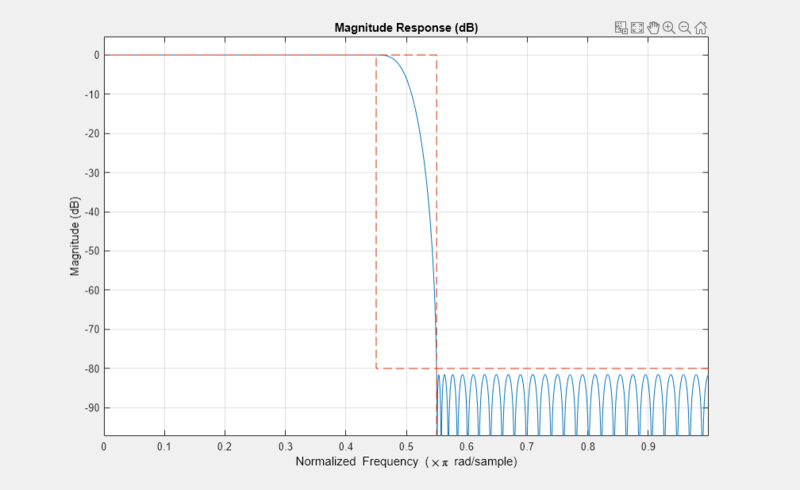 The MaxPhase design option for equripple FIR filters is currently only available for lowpass, highpass, bandpass, and bandstop filters.